Diary Why I won’t be able to drive in England. Most people say that the driving in Africa is appalling, but I prefer to regard it as dangerously exciting as I feel a strange kind of freedom to indulge in driving behaviour that I would never get away with in the UK. Over the last few days I could have forfeited my licence a 100 times and have ended up with several hundred penalty points on my (currently) clean UK driving licence. Let’s see now, where do I start….Overtaking traffic on the inside on a single carriageway road leading up to speed bumps with half the car on the pavement (probably 6 to 8 points in the UK) Going the wrong way round a roundabout to avoid waiting in a bit of traffic waiting to exit. (say 4 to 5 points) Making my own road off road to avoid queues of traffic (not sure if this is actually against the law!) The few things that I do that surprise the locals is let drivers waiting to join the flow of traffic in with a friendly wave and an “after you chief” and giving way to pedestrians with a “after you boss” I don’t speed (mainly due to the roads and the number of people and animals around) The vehicles I never give way for are UN or European Union (Where did you get your licence? Brussels?) Toyota Land Cruisers and the 1000s of Toyota Hiace Matatus (minibuses for the masses) whose drivers are completely mad and have big decals on saying things like “God sees everything” or “Jesus loves me” although I’m glad someone does as he probably ran over his own mother last week! Anyway, if you are a traffic policeman (the Black Rats in the Wiltshire force, I believe) in the UK and see a large silver Defender 110 speeding along a motorway embankment in say December ’06 have some pity for the driver….he really does want to be good, it’ll just take some time! 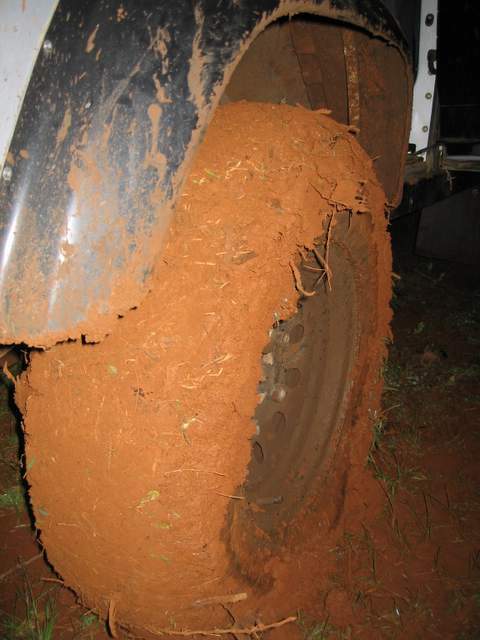 PIC SHOWS: AFRICAN MUD SEEMS TO LOVE LAND ROVER TYRES.